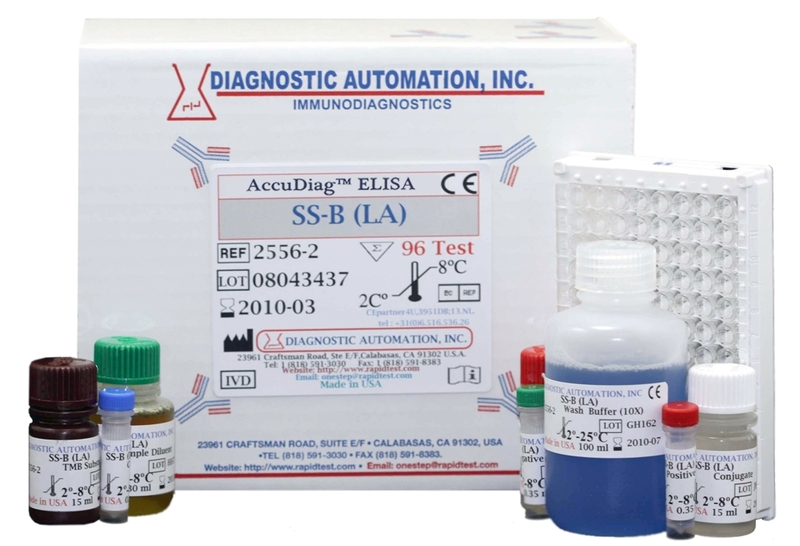 SS-B (La) ELISA kit | FDA-CE | 818-591 3030-USA. 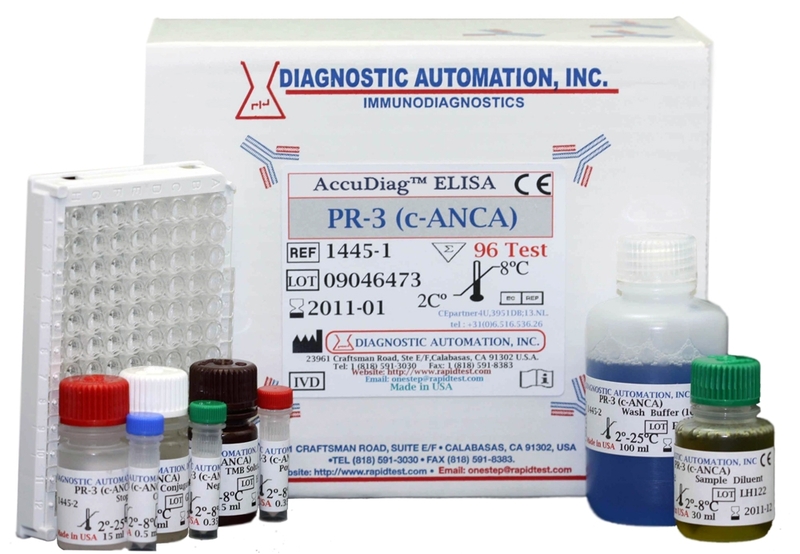 Diagnostic Automation SSB (La) ELISA test kit is a semi-quantitative immunoassay for the detection of IgG antibodies to SSA (Ro) in human sera. The Diagnostic Automation SSB (La) ELISA test kit is designed to detect IgG class antibodies to different autoantigens in human sera. Wells of plastic microwell strips are sensitized by passive absorption with immobilized antigens. The test procedure involves three incubation steps. For additional details please refer to the instructions for use. Product inserts for all Autoimmune ELISA kits follow a similar method. See the SSB (La) ELISA Kit product insert for specific details on preparation, procedures, quality control, and test result interpretation. 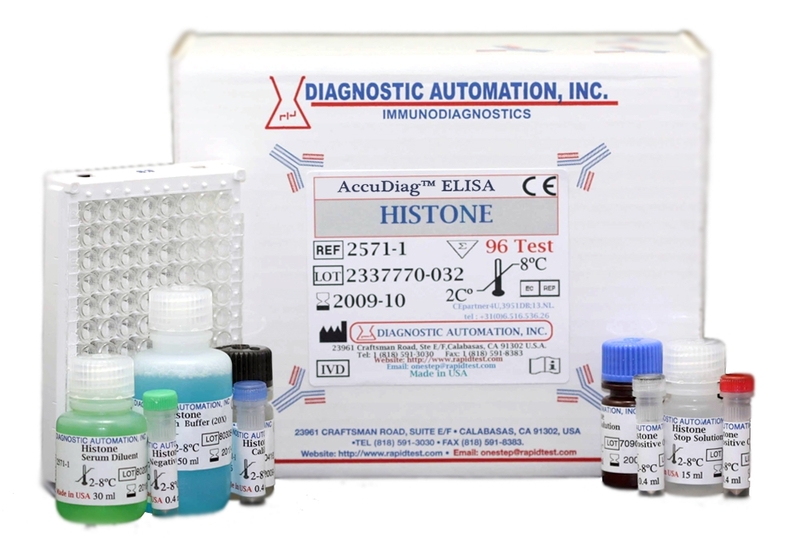 Diagnostic Automation Inc. also, provides other Autoimmune Disease ELISA Kits. For more information about ELISA Kits, Rapid Tests, IFA Kits, CLIA Test Kits, or Serology tests, please see our website home page, or contact our Customer Service Representatives at 818-591-3030.